This Specialized ROGERS 55-ton capacity trailer has the exclusive "Croucher"® platform deck featuring the award winning wheel wells. This is a multi-use lowboy capable of carrying excavators, rubber-tired loaders, or milling machines just by removing the deck inserts. This special design of ROGERS wheel wells in a platform deck allows a rubber-tired machine an extra 10" of overhead clearance while providing the platform deck needed to haul a milling machine or excavator. Special "fillers" were made for the two forward wheel wells to facilitate loading an excavator. The rear frame is designed with reinforced tread plate wheel covers and removable wood-covered inserts to provide extra traction for track-style milling machines. The "No Foot"® gooseneck can be adjusted for the height of the towing tractor. 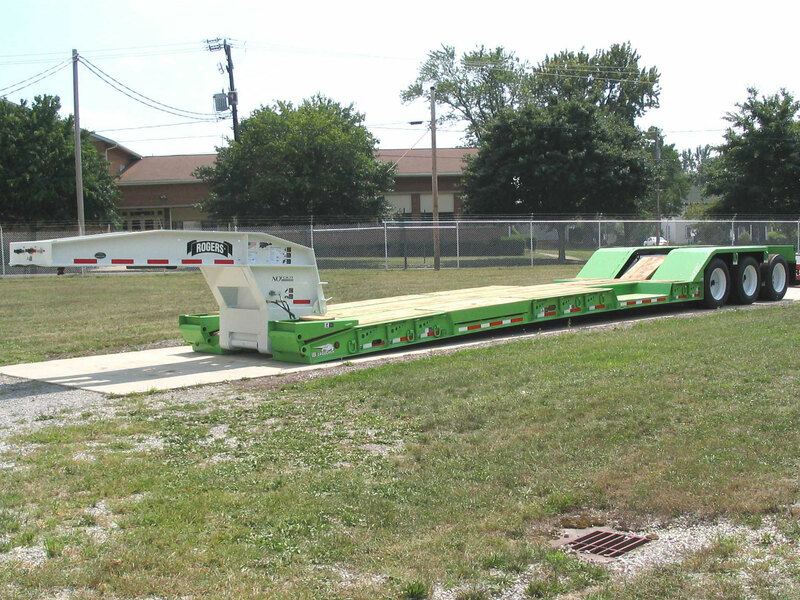 Bi-fold front loading ramps assist loading large machines easily.